Specialising in, and performing high volumes of, minimally invasive partial knee replacements and knee ligament reconstruction, Julian Flynn is a consultant Trauma and Orthopaedic surgeon, working in Milton Keynes at the Milton Keynes University Hospital, and privately at The BMI Saxon Clinic, since 2002. 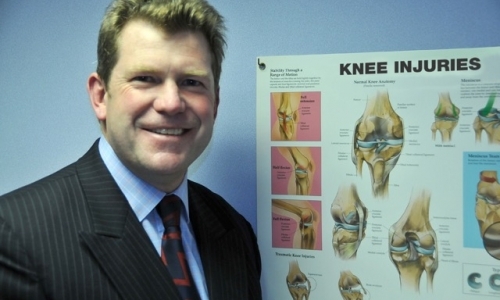 His practice covers all areas of knee surgery, and lower limb arthritis, injuries and pain. He has specialist expertise in arthroscopic and minimally invasive knee surgery, managing arthritis in younger patients to delay or avoid joint replacement, primary and revision ligament reconstructions, partial and total knee replacements, total hip replacements and sports injuries. 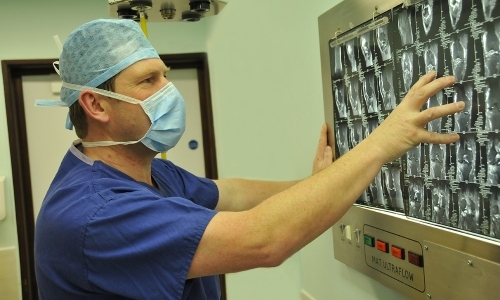 As the senior lead knee surgeon at Milton Keynes Hospital, with the most comprehensive range of expertise locally, covering all techniques in knee surgery, he receives referrals from departmental colleagues, and further afield, for routine and complicated knee problems. 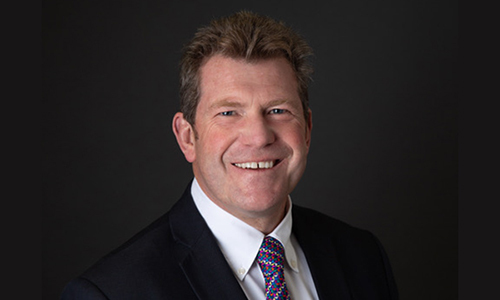 With over 15 years experience as a consultant, Mr. Flynn has built up a busy practice, both in the NHS and privately, emphasising the importance of tailored surgery to each individual, and patients can be assured they have access to the complete scope of management options for their particular complaint. He recognises only too well from personal experience, the increasing toll that sports take on the body as we get older, and the desire to remain a ‘weekend warrior’ for as long as possible. He is acutely aware that if patients have an injury that may benefit from surgery, patients want and appreciate the most minimally invasive options available to enable rapid recovery, and minimise interruption to sporting, leisure and work aspirations. Many conditions however do not require surgery, in which case timely diagnosis, appropriate rehabilitation with well-trained therapists, reassurance, support and careful monitoring are required to obtain optimal recovery. Mr Flynn expects to maintain a very high standard of care to patients he sees, and has a reputation for offering honest, clear and sympathetic management, with excellent technical results. Mr Flynn’s undergraduate pre-clinical studies were at Oriel College, Oxford, prior to clinical training at St.Marys’ Hospital, London, gaining his medical degree in 1990. 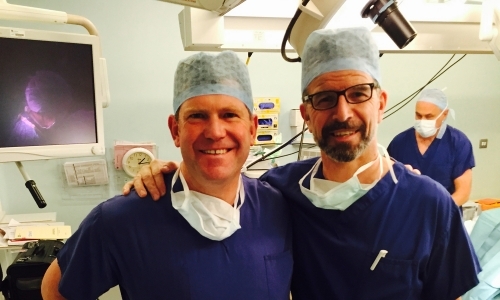 Following junior posts around London he obtained FRCS in 1994, and then returned to Oxford to complete Trauma and Orthopaedic studies on the prestigious Oxford Training Programme. He gained FRCS (T+O) in 1999, and then completed an Arthroplasty and Sports Injuries Fellowship at the Melbourne Orthopaedic Group in Australia, a renowned orthopaedic unit treating many elite and Olympic athletes, in the Olympic year 2000. 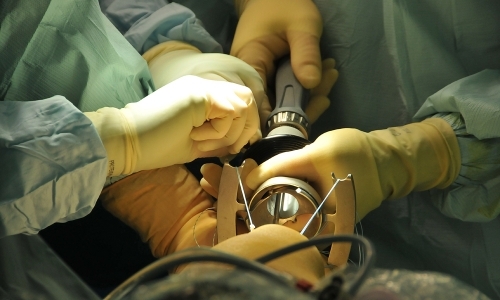 Research included possible techniques to improve earlier return to normal function after arthroscopic cartilage surgery, and he became familiar with the early development of novel techniques and operations which are now widely practised. In 2001, he completed a paediatric Orthopaedic Fellowship at the world renowned Hospital for Sick Children in Toronto, Canada, prior to taking up his consultant post in Milton Keynes specialising in knee surgery, hip surgery, paediatric orthopaedics and trauma. 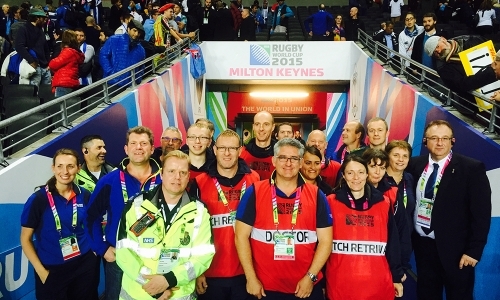 Mr. Flynn has looked after professional athletes, sportsmen and women from a wide variety of sports including MK Dons Football Club, Northampton Saints Rugby Club and MK Lions basketball team, MK Lightning ice hockey team, international level ski racers and triathletes. 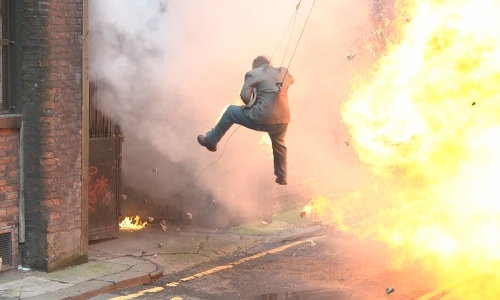 He has also had the challenging opportunity to look after a number of world leading stuntmen and women, stunt directors, actors and film directors.In 2015, he acted as orthopaedic specialist to the medical teams at the Rugby World Cup matches in Milton Keynes. He has lectured and taught on national and international courses on topics including arthroscopy, chondral injury management, partial (unicondylar) knee replacement (UKR), total knee replacement (TKR ), and ACL reconstruction. This allows him to constantly review ways of enhancing techniques, aiming to continually improve results as new evidence becomes available. Interests outside of medicine include, enjoying spending time with family and friends, golf, skiing, tennis, rugby ( watching ), and cycling. Mr Flynn was MAC (Medical Advisory Committee) Chairman at BMI Saxon Clinic for 3 years , following 2 years as T+O representative. From 2011 -2016 he has been Clinical Director of MKUH T+O Department. During a time of huge change in the NHS he has acted as Clinical Governance lead and Complaints lead, championing patient safety, and encouraging an open, responsive attitude to become common place at all levels of clinician. He has driven the adoption of a Rapid Recovery Programme, now being implemented and refined at the General hospital, to safely reduce in-patient stay post operatively, improve pain management, and enhance recovery. These positions have afforded valuable insight into wishes and aspirations of patients, which he tries to reflect in his consultations, and continue through a whole treatment, from referral to discharge, with each and every patient, whether seen at the University Hospital or at BMI The Saxon Clinic. In 2014 he was appointed Royal College of Surgeons / British Orthopaedic Association Regional Specialty Advisor, and is currently the local lead for the National Joint Register, and the area ‘Clinical Champion’ responsible for trying to improve patient pathways.